Visible perpetrator materials are special powders or pastes that are applied on valuable items like bank-notes, documents, laptops etc. Touching these marked items will create a long-lasting, clearly visible and permanently existing dot on the fingers and hands. Even persistent washing with water and soap cannot remove these stains which easily detect the theft. Invisible perpetrator materials, however, are special powders or pastes which are only visible under special UV-lamps (like our PKI 5405) and are invisible to the naked human eye. With the PKI 9800, we offer a complete set of every necessary material for a rapid and effective perception of perpetrators. 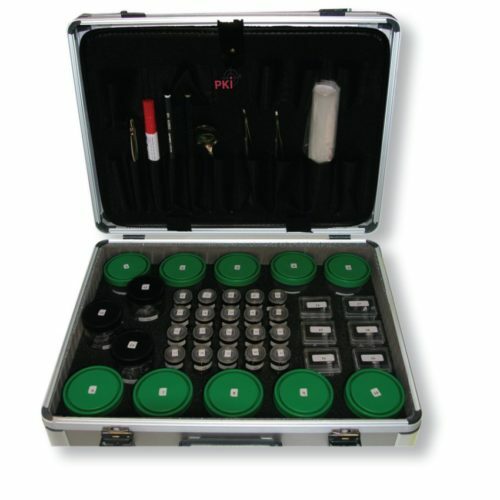 Other companies only offer single components which then have to be assembled to a workable kit. Our complete case PKI 9800 offers all this in a “all-in-one” assembly of state-of-the-art materials, guarantying that each government department is perfectly equipped with an outstanding assortment of visible and invisible powders and pastes plus every necessary tool in order to identify the perpetrator.